Badal said Modi has brought a major change in the country and prayed to God that Modi should return as the Prime Minister. Shiromani Akali Dal (SAD) supremo Prakash Singh Badal on Saturday heaped praise on Prime Minister Narendra Modi for his decisive nature and also on BJP president Amit Shah for his extraordinary organisational abilities. 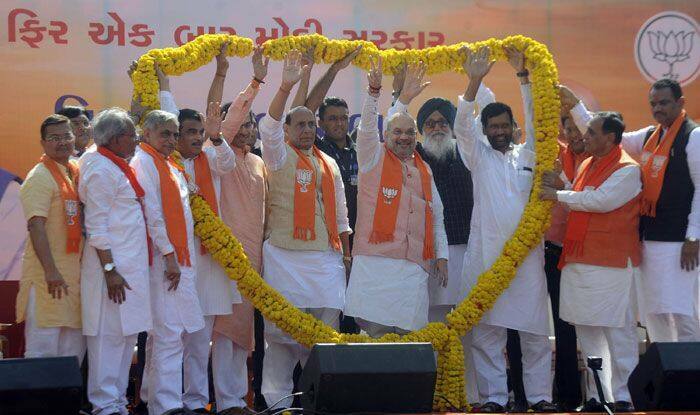 Addressing a gathering here before Shah files his nomination for the Gandhinagar seat, Badal said that security in the wake of India’s strikes against Pakistan will be the major issue in the upcoming elections. “Modi has done so much of service to the nation and has taken the nation’s name high due to his decisive nature. “Under his leadership, the security of the country is totally intact. With surgical strikes and then the aerial strikes, he has taken the name of India high. The biggest thing was there was no casualty to our forces in the operation. He has also crushed the militancy effectively,” Badal said. The former Punjab Chief Minister, as the oldest and reliable ally of the party, said Modi has brought a major change in the country and prayed to God that Modi should return as the Prime Minister. The veteran leader also hailed Shah for his organisational skills and dubbed him the world’s biggest organiser. “He is not a man but is an ‘institution’ of sorts. His entire life was a lighthouse. He is the world’s biggest campaigner and organiser,” Badal said. He said after Modi, it was Shah who should be credited for the Bharatiya Janata Party’s victory in the 2014 Lok Sabha polls. He said while the ruling party has Modi, the opposition had no one. “Even when an Assembly elections takes place, every party or coalition projects a leader as its chief ministerial candidate but the opposition does not even have a prime ministerial candidate for the coming Lok Sabha polls,” Badal added.